I was pretty much raised Italian (even though technically I'm only half) and that meant no meat on Friday's during Lent and fish on Christmas Eve. We never got too fancy with it, maybe we'd have lobster or stuffed clams along with a nice linguine and shrimp dish that my mother had perfected over the years. Three years ago I volunteered to host Christmas Eve at my house so my mother would have a little less to do around the holidays. I knew I wanted to keep the fish tradition going, and had heard quite a bit about the "Feast of the Seven Fishes" that some Italian families partake in, so I decided to give it a go. A little research revealed that nobody is quite sure why seven fishes is the number, and in some parts of Italy, it's actually nine or eleven or thirteen. The common theme though is fish, and one type that I kept reading about was salt cod, or baccala, although the other six types seemed to vary quite a bit. I love fish, especially in sushi form, but for a number of reasons I don't buy it and cook it very often. Consequently, I'm not super confident when it comes to preparing fish. Not wanting to jump in over my head, I started out three years ago with four fish dishes and upped it to five last year. This year I felt I was ready for seven. I planned out my menu, which would include seven fishes (scallops, cod, tuna, pollock, sole, shrimp, and crab) spread out through an appetizer and five subsequent courses. I planned on starting appetizers at 7:30, serving the first course at 8:00 and another course every 25 minutes after, finishing around 10. I prepped everything that I could in advance (with a substantial amount of help from my father), and made a timeline that ran from 7:30 to 10:00 so I would know when to preheat ovens, start warming soup, boil water for pasta, start a sauce, etc. The dinner was quite a success, and all the dishes were pretty good to great. The appetizer course was scallop and cod ceviche served with sliced avocado and tortilla. I didn't really want to do shrimp cocktail again because I'd already done it the previous two years and I find it to be a little boring. I had seen ceviche many times on various cooking shows, and decided to give it a try. 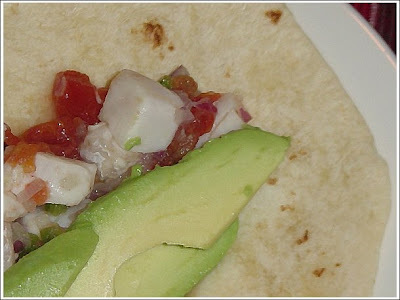 Ceviche is small pieces of fish marinated in lemon or lime juice. The acid in the juice denatures the proteins in the fish, essentially cooking them without heat. I chose this recipe from the Simply Recipes blog and was quite impressed with the results. 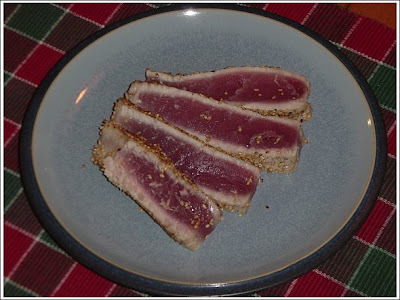 The first course was sesame seared tuna, which my mother and brother really love (as well as myself). The preparation is very simple, as the tuna is rubbed with a little oil, salt, and pepper, then pressed into some toasted sesame seeds. It is placed in a hot pan and cooked for about 2 minutes, then flipped and cooked for about 2 more minutes. The resulting fish nicely seared on the outside, and still cool on the inside. Delicious. High quality tuna is a must for this dish, and I used a recipe from America's Test Kitchen. The second course was a salt cod cake. This year I went non-traditional and actually used salted pollock instead of cod, and there was no noticeable difference in the result. 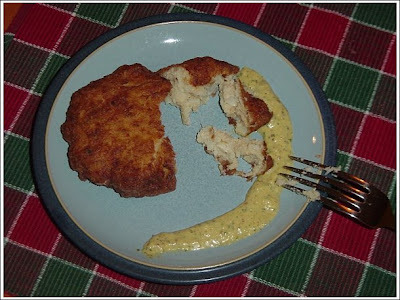 The recipe comes from Mark Bittman's How to Cook Everything, and combines the fish with mashed potato, egg, and bread crumb and formed into little cakes. The recipe has you pan fry the cakes in a oil, butter, or bacon grease, but this year I deep fried them in canola oil which resulted in a much nicer and more uniform golden brown crust. I actually fried these up in the early afternoon, and reheated them just before serving. 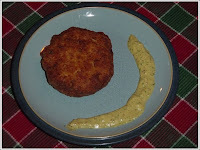 The real key to this dish was a delicious condiment called remoulade - I used an excellent recipe from Emeril. 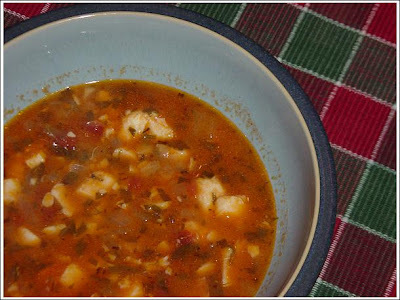 The third course was a simple fish stew which was really easy to make and very very good. This is another recipe that came from the Simply Recipes blog. I used cod and sole for the fish. I made the stew in the early afternoon and let it sit all day for the flavors to blend, then reheated it before serving. The fourth course was penne all vodka with shrimp. This is a slightly modified version of a recipe from the Sopranos Family Cookbook. This is a can't miss recipe. 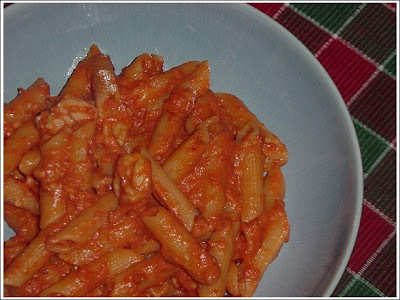 The sauce takes as long to cook as it does to cook the penne, and then you just toss it together and serve. Everybody loves this dish. My slight changes are no prosciutto (wife doesn't do pork), and the addition of a half a pound of shrimp sliced in half lenghtwise (so they curl up), which I add along with the vodka. If you're not much of a cook, but your having somebody over for dinner, make this. The fifth course was a seafood gratin from Ina Garten (the Barefoot Contessa). The past 2 years I had made a modified version of Jamie Oliver's Prawn and Pea Risotto with Basil and Mint for the final course, last year even perfecting a method of partially pre-cooking the risotto so I wouldn't have to make the whole thing in between courses. This year I wanted to do something different (and less filling) for my final course. While randomly flipping through the channels a few weeks ago, I landed on the Food Network and Ina was already well into this recipe. 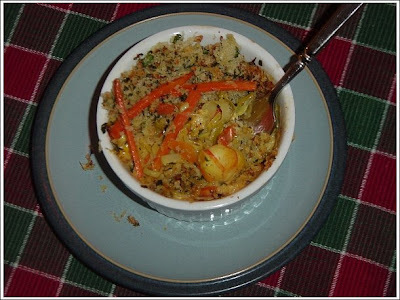 I saw her pour a creamy, golden sauce over some combination of seafood and top that with sauteed leeks and carrots, then seasoned, buttered panko crumbs. Then she baked the whole thing. I'd found my final course. The recipe was a bit complex, as you need to make the sauce, cook the fish in it, remove the fish, reduce the sauce, sautee the veggies, put it all together and bake it. This recipe is not a cheap one to make either, as the golden color of the sauce comes from saffron, the world's most expensive spice, and aforementioned "combination of seafood" turned out to be shrimp, lobster, and halibut (I used shrimp, cod, and lump crab meat). I was able to put this dish together in the afternoon, and all I had to do was top it with the breadcrumbs and bake it about a half and hour before serving. Despite the effort and cost, the result was worth it - a sumptuously rich combination of flavors and textures, and a delicious final course. 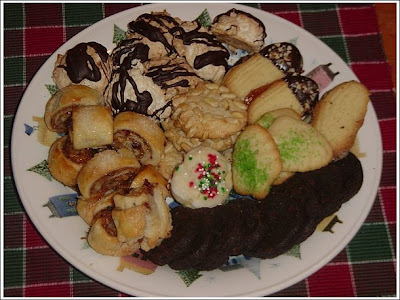 And for dessert a delicous cookie tray put together by my mother, who makes some of the best cookies (pies, cakes, etc...) that I have ever tasted. All in all, a perfect Christmas Eve dinner.